Did you know that women are the fastest growing group within the Veteran population? There is indeed a cultural transformation going on throughout the entire VHA. Women Veterans will notice the physical environment is changing to include family bathrooms, baby changing tables accessible to both male and female veterans, a Mother’s Room for Veterans who are breastfeeding, and children play areas. VA provides care to women Veterans of all ages and conflicts and understands the needs of our women Veteran’s better than anyone else. Our staff is highly trained and skilled in women’s healthcare issues, we have innovative programs and services to provide quality care in an environment that ensures the dignity, privacy, and safety of every Veteran. Women currently comprise approximately 10% of all living US Veterans and is projected to rise to 15% by 2035. 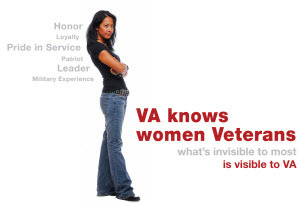 The number of women Veterans using VHA services has been increasing by 7% per year. In FY 2011, the average age of women Veterans was 48 years, compared to 63 years for their male counterparts. Jan 24, 2013, the ban on women serving in combat was removed. The roles for women have changed and now include: gunners, police, pilots, truck drivers, & fuel suppliers. In FY 2014 musculoskeletal issues, mental health disorders, and nervous system disorders were the top three diagnostic categories for women Veterans treated by VHA. About 1 in 5 women seen in VHA respond "yes" when screened for Military Sexual Trauma (MST). Women are 30% more likely to have PTSD than their male counterpart, 2 times as likely to be diagnosed with depression, 4 times more likely to have substance abuse, 2.7 times more likely to be unemployed, and 7 times more likely to be homeless. PACT is a patient center team approach to providing you with quality health care. Enrolled Veterans will choose a PACT to provide comprehensive primary care. This means that one provider and team provide all the woman’s primary care including preventative care, acute care, and care for chronic illnesses. The women’s health primary care provider and team also coordinate care received by the woman Veteran from other providers. This includes referrals to sub-specialty services such as gynecology and mental health. VA Salt Lake City Health Care System offers non-VA funded prenatal & maternity care, limited newborn benefits, and parenting classes. A wide range of gynecology services are available. Infertility evaluation and treatment is available to enrolled veterans and In-Vitro Fertilization is available only to those veterans who qualify. For more information about these services and limited infertility and newborn benefits call the Women Veterans Program Manager at 801-582-1565 Ext. 4510. Military Sexual Trauma (MST) is the term that the Department of Veterans Affairs uses to refer to sexual assault or repeated, threatening sexual harassment that occurred while the Veteran was in the military. Both women and men can experience MST during their service. Special services are available to women who have experienced MST. VA provides free, confidential counseling and treatment for mental and physical health conditions related to MST. Are you making healthy aging a priority in your life? Staying healthy as you grow older means taking time to recognize and address your changing health needs. VA provides a variety of primary and specialty care services that can help women Veterans age in good health. Click here for more information on healthy aging. Veterans are twice as likely to die from an accidental overdose when compared to their non-veteran counterpart. The tide is turning away from increasing opioid doses, and opioids as the sole treatment for chronic pain. Evidence suggests that in addition to opioid medications, incorporating a multi-modality approach to include holistic and integrative programs such as yoga and mindfulness, improves daily functioning and is more effective than opioids alone. The Women’s Service at VASLC offers veterans taking opioids for chronic pain, education, safe monitoring, and referrals to holistic and integrative programs at the end of class. The focus of the Program is safety and team work, the patient is central. Please contact (801) 582-1565 x2685 for more information. The Women’s Musculoskeletal Clinic at VASLC is an opportunity for women Veterans to work with specialists who will evaluate their chronic pain and together develop a treatment plan. When appropriate, steroid joint injections, trigger point injections, and battlefield acupuncture are administered by trained and competent staff. This clinic is the gatekeeper to further radiology test such as xrays and MRI’s as well as referrals to surgical and other specialty services. Please contact (801) 582-1565 x2685 for more information. The SLC Women Veterans Program has ongoing Trauma Sensitive Yoga, aqua therapy, mindfulness, walking, nutrition, and other classes. In addition, we offer group programs such as Cognitive Behavioral Therapy for Chronic Pain, and Living Well with Chronic Conditions. We work closely with our National Abilities Center partners to provide outdoor and indoor activities, special events, and winter and summer retreats for women Veterans. If you would like to have more information, please contact the Women Veterans Program Manager at (801) 582-1565 x 2151. The Women Veterans Call Center was created to increase women’s knowledge of VA benefits and services, increase enrollment, and increase utilization of health care services. The operators are trained to provide information on VA’s benefits and services. The Veteran will be referred to a Women Veteran Program Manager (WVPM), Health Eligibility Center, Veterans Benefits Administration and suicide and homeless crisis lines as needed. The phone number for the WVCC is 1-855-VA-WOMEN or 1-855-829-6636. Please allow a 30-day follow-up call to the Veteran from the WVPM. Hours of operation: M-F 8:00AM- 10:00PM, Saturday 8:00AM- 6:30PM.